The Relationship Between Transportation and Urban Growth in Cincinnati. Early travelers along the Ohio River recognized its large flat basin as a good place to settle. The basin includes downtown, Over the Rhine, the West End, and low lying areas of Northern Kentucky, including Covington and Newport. These low areas were created by the pre-glacial Licking River, which flowed north through present day Northern Kentucky, across what became the Ohio River, and up the present day Mill Creek channel to Hamilton, Ohio. Near Hamilton it joined the pre-glacial Kentucky River, continuing north to its confluence with the Teays River south of present day Lima, Ohio. The Mill Creek is an under-fit stream, meaning the valley is too wide to have been eroded by the existing creek. “Greater Cincinnati was founded at the confluence of three major tributaries to the Ohio River. Such extensive water systems allowed access to a large land mass, and soon made Cincinnati the regional center of river trade. Surpluses of the region's pork, wheat, corn, whiskey and other agriculture products were soon being transported by flatboat to New Orleans for shipment to the Atlantic Coast. Due to the lack of furniture shipped westward during the nation’s expansion, furniture making became one of Greater Cincinnati's earliest industries. Saw mills flourished with the area's surrounding dense forests as supply, and furniture making remained one of Cincinnati's largest industries for over a century." They also note that "by 1860, Greater Cincinnati was the world's leading meat packing center. This huge industry gave rise to several other area industries involving leather, lard, candle and soap." The proximity to the river obviously was a benefit to business, but business booming was not necessarily beneficial to residents' health. Due to the steep hills surrounding the basin, the pollution from economic activities and daily life, including the stench from rotting pig blood, horse manure, and smoke from cooking, heating, and manufacturing did not dissipate. Residents inhaled an unpleasant and unhealthy concoction. It was the worst on hot summer days. For almost a hundred years after its founding, its citizens of Cincinnati were confined to the basin. The only way to escape the pollution in the basin was to flee to the surrounding hills. However, the trek up was treacherous, and only the very wealthy could afford the horses needed to escape. It quickly became obvious that horse drawn carriages would not suffice, thus the beginning of the Horsecar Lines. 1. Background Geology, Landforms Fox Rock. Cincinnati Nature Center, 1976. By the 1850's the population of Cincinnati was over a hundred and fifty thousand. The basin could no longer hold the population which was quite spread out along the river. Omnibuses, basically carriages that held more passengers, were being used as mass transit within the basin. The Omnibuses would climb the hills, but it was extremely taxing on the animals. The trip almost impossible in good weather and basically impossible when ice was on the ground. Now that the need for better transportation was obvious, various groups planned a system of Horse car railways. The photo at right shows a typical Horsecar. They were drawn by horses, but they ran on metal tracks. 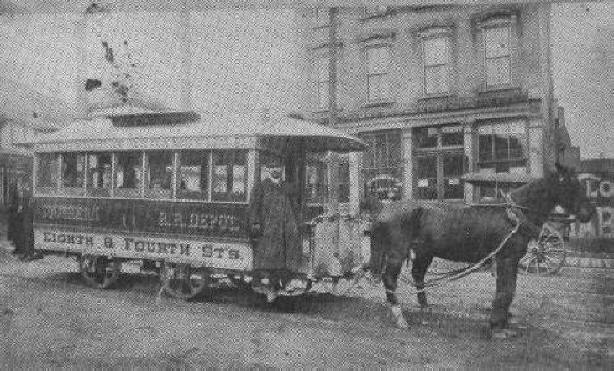 The first Horsecar began operating in 1859, by 1860 five routes existed. 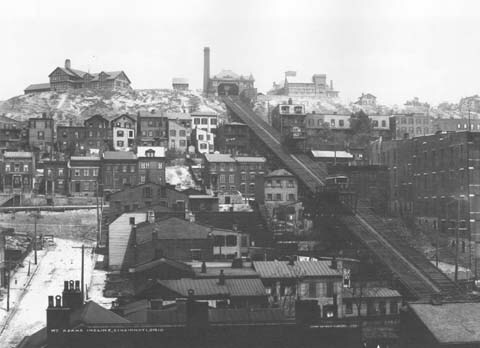 From 1860 to 1876 eight more routes were added, and by 1880, with the help of the Inclines, the Horsecar routes extended far outside of the basin. Please see maps for extent of the Horsecar lines. 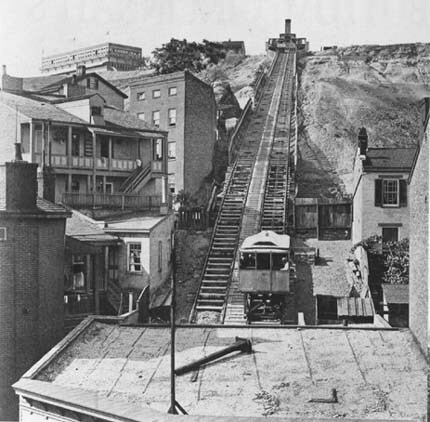 "When the first incline was built it was regarded as very speculative scheme but its success was immediate and this prompted the erection of the city's other inclines, which, by opening up the hills, speedily led to a spread of the population over a large area and relieved the congestion of the lower level of the city." 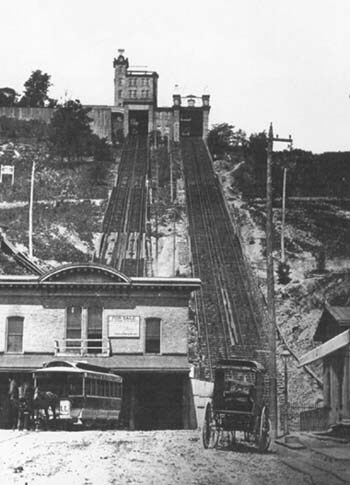 (1) There were five inclines built, the first opened in 1872 and the last one closed in 1948. The impact of the inclines on the expansion of the city cannot be stressed. Please see the Incline Map to view their locations. Cable cars were an improvement over Horsecars. However their extent was small and in some places the cars would be changed from the cable to a team of horses for part of the route. The cable cars made for a smoother ride and also the public pained by the short, rough lives of the horses who pulled the cars. The cables ran continuously in a slit under the street. The cars ran on tracks and had a mechanism that reached into the slit and grabbed the cable to move, or released it to slow or stop. Each of the routes had a building known as a turntable. This was a powerhouse that turned the cable a great wheel. The cables did have to be replaced periodically, but this was done during off hours to minimize service disruption. There were only three cable car routes, Gilbert Avenue, Mt. Auburn, and Vine Street. Please see the Cable Car Map for route details. Despite the advantage of Cable cars they were short lived. This was due to the experimentation with electricity as a new type of power. Electricity proved to be a cheap and efficient source of power for mass transportation. It was not long before the Cable cars were converted and, along with Horsecars, were obsolete. The ground covered by the Streetcar routes continued to increase, and suburban development followed. These 'newer' old suburbs include, Norwood, Madisonville, Pleasant Ridge, College Hill, and Mt. Airy. The development was along these linear paths, but the paths were arranged in a radial fashion from the basin. Also, there were Interurban, or Short Line, Railroads. In the beginning only the wealthy could afford these, but, eventually they were the connection between downtown and far outlying suburbs. The streetcar companies used a different gauge track so that the Inter-urbans could not run in downtown and encroach on the Streetcars' territory. During the 1920's the automobile began to play a role in the way Cincinnati was developing. Before the auto most people lived within walking distance of the Streetcar or Interurban routes. However, the automobile made it easy for people to begin filling in the spaces between the linear paths of the Streetcar Lines. 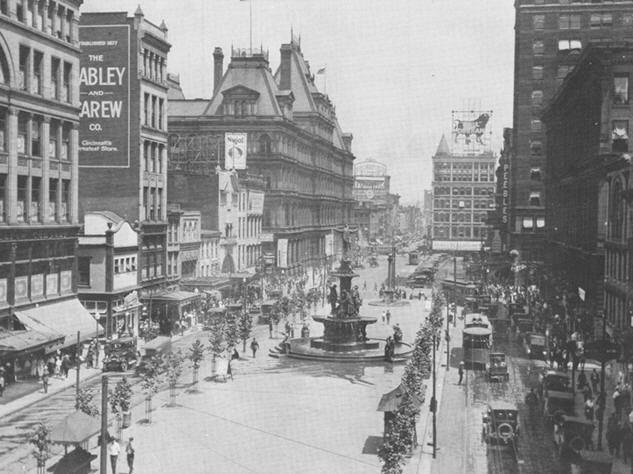 Eventually, automobiles and later, buses, ended the use of mass transit in Cincinnati. Please see the maps to view extent of Streetcars and Inter-urbans. The highways began in earnest, and continue to increase, the decline of the downtown area and the older suburbs. They provide for the movement of the population and businesses farther away from the basin. At first the highways allowed residents to move away from the pollution and dense population of downtown, while still working in the downtown business core. Eventually businesses, especially with modern technology, realized that they did not need to be located in the core business district. They realized that they could move to the newer suburban areas, which have lower property taxes, build a building which puts their 'mark' on the landscape, and be close to their employees. Also, the services that residents and businesses require have sprung up near these new developments. The result is that Cincinnati's population has decreased, while the amount of developed land has increased. There has been a movement away from the basin. At first when I71 and I75 were built this movement was still linear along the highways in a radial fashion from the basin. Later, 562, I74, and the Cross County Highway allowed for infill away from and between I71 and I75. I275 was constructed in a loop around the city and has created expansion even farther away from the core. This is the type of expansion occurring today. Businesses, services, and residents are located along the beltway. These clusters of development are called Edge Cities, they allow residents to move even farther out or fill in around the loop, and there is no need to return to the basin, except for entertainment. For a comprehensive study of the development of the highways please see the Cincinnati Transit website. For a map showing the years each highway was constructed, please click on the Highway Development map below.